If you are a Mac user, then you are in luck. I recently came across an amazing productivity software by the name of Firetask that I personally believe will help almost any busy person get organized. I read a magazine entitled “Productivity”, and it is loaded with great ideas, stories and recommendations on software productivity tools and they mentioned Firetask software in one of the issues of the magazine. Firetask is a company based in Austria, and in my podcast with Gerald Aquila the founder we speak about the benefits and features of the Firetask software he developed with his partner. Gerald is also the founder of OnePoint, a comprehensive project management system, which by the way is very well designed and a cloud based project management software. Firetask is exceptionally well designed, an the user interface is wonderful—very intuitive. Firetask is simple, fun and easy to use with a set of features that any busy person will appreciate. It allows you to create and manage projects as well as view the your tasks in what Gerald refers to as the organize view. Firetask follows the system thinking that David Allen has made popular called “Getting Things Done“. It is also customizable with allowing you to name categories as well as drag and drop your created tasks into the categories sections. There is a wonderful calendar view allowing you to take a birds eye view of your tasks and projects on a monthly basis. The software built in filters, so that you can view just the tasks that are top of mind. Firetask has something that Gerald refers to as a Scratchboard. This is designed to assist you when something comes across your desk, and you don’t have time to deal with it, just place it in the Scratchboard and save it until you can reference it and categorize the item. The best part of Firetask is that it is easy, fun and very intuitive to use. 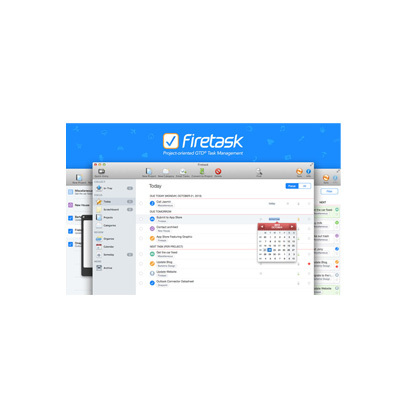 If you are an iPad user Firetask has the companion application for the iPad which synchronizes with the desktop version using a cloud based system. Believe me you are going to love this simple, inexpensive productivity tool from Firetask. For more information please click here to be directed to the Firetask website, or send an email to firetask@gmail.com Gerald and his team will be more than happy to assist you.